Two common types of crashes on a motorbike are the lowside and highside crash. Both of them start with one of the wheels beginning to slide from underneath the rider, but they end in spectacularly different outcomes. Riders would prefer to have a lowside crash than a highside crash because the crashes are generally less severe (all other things being equal) as you tend to just slide out. A lowside crash is where one or more of the wheels slides from underneath you as you are cornering. It’s a very common accident, especially among new riders and one that can easily happen if there’s a bit of mid-corner sand or oil on the road. The most common way it happens is that riders don’t finish braking before they start turning. You should always brake and change down through the gears while travelling in as straight a line as possible. While you are braking your front wheel is doing 75-90% of the work in stopping the bike. If you then try to force it to corner as well, this can often overcome the level of friction available on the road and the front wheel washes out from under you and you have very little hope of controlling the bike. The second way it can happen is that you enter the corner too fast and exceed the level of grip of one or both of the tyres, and the third way it can happen is that you apply too much power while you are still leaning in the corner, the rear wheel spins and slides sideways, spilling you off the bike. The solution is to brake enough before you get to the corner, then accelerate gently out. Let’s look at three examples. The first is where the rider on the white Harley has come into the corner too fast. He has to lean the bike over too much and the peg starts dragging on the ground. This lifts the back wheel which then loses grip and he slides sideways. You can see how much damage is caused to the bike even in this low-speed crash. The rider is lucky to have minimal injuries despite wearing little in the way of protective clothing. Heavy bikes with large amounts of bodywork or low pegs are more likely to be at risk of this type of accident. You can see in this crash that the rider applies too much throttle and loses grip extremely quickly on the back wheel. This could have been because the throttle was applied too quickly which allowed the wheel to break traction or, if it was applied gradually it simply exceeded the level of possible grip. This is less common for learner riders because the bikes are not powerful enough. The rider in this crash is either carrying too much speed or uses too much front brake (or both). In the slow motion replay you can see the front wheel lock as it slips sideways so the rider was still braking and exceeded the level of friction available on the road. Learner riders commonly carry too much speed into corners. As you can see from all the above relatively low-speed lowside crashes, the riders walk away fairly unscathed. This isn’t necessarily the case, though, if you are riding a lot faster as you can slide into something solid like a wall or tree. Riders do not want to have a highside crash because the bike bucks them into the air and there’s the potential for greater injury because the rider is thrown into the air and will land hard, and there’s the potential to be thrown in front of the bike and then be hit by the bike after you’ve hit something fairly immovable. The rider loses control of the bike and is thrown over the bike. It most commonly happens when a rear-wheel slide is over-corrected and the bike regains grip, flipping the rider in the opposite direction. Locking the rear brake is a common cause, although it can also be caused by the rider quickly closing the throttle when detecting wheelspin which causes the rear wheel to grip suddenly, throwing them off balance. It can also be caused by a wheel lockup caused by a loose chain or an engine seizure. 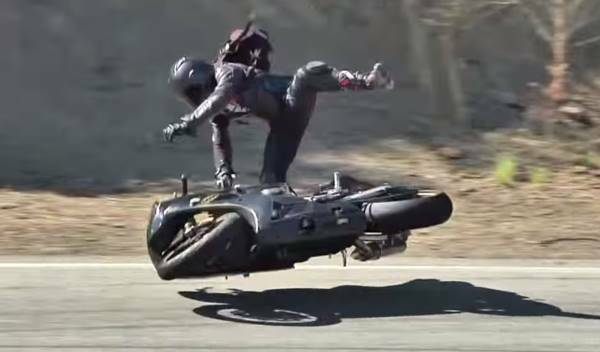 This video shows a highside crash where the rider catches the skid, but loses control. You can see the importance of motorbike protective clothing (read more here) in the slow motion replay. The rider’s head hits the ground hard, his leg hits the bike and his back slides across rough rocks that could easily cause paralysing results. At the end you’ll see the damage to the helmet.